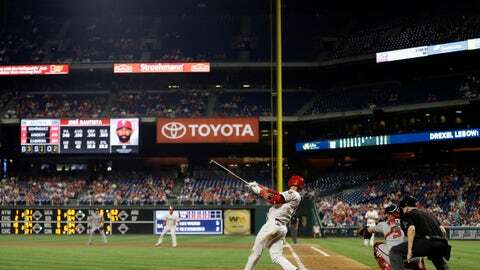 PHILADELPHIA (AP) — The Phillies added veteran Jose Bautista for his potent bat, but it’s the confidence he displayed on Wednesday night that might help even more. Being in a tough spot in the middle of a pennant race doesn’t faze the 37-year-old Bautista, a six-time All-Star with 342 career homers. “Get outs, that’s it,” he said. Rhys Hoskins‘ two-out RBI double in the bottom of the eighth gave the Phillies a two-run cushion. Santana’s two-out drive to center in the fifth put Philadelphia on top 6-5. It was his third career grand slam and first since Sept. 18, 2015. The Nationals, after giving up a pair of runs in the second, scored five straight to take a three-run lead. Soto hit a two-run homer to left as part of Washington’s four-run third inning for his 16th of the season, and the 19-year-old tied Hall of Famer Ken Griffey Jr. for fifth all-time for home runs by a teenager. More shoddy defense helped the Nationals tie the game in the sixth. Difo singled, went to second on a passed ball by Wilson Ramos and scored on pinch-hitter Andrew Stevenson’s one-out single to right. It was the 58th unearned run of the season against the Phillies, who have been plagued by mistakes all season — and especially during their slump. Philadelphia entered tied with the Cardinals with a major-league worst 102 errors, two of which came in Tuesday’s 5-4 loss to Washington. That game ended when pitcher Vince Velasquez, pinch-running in the ninth, was called out for leaving second base too early while trying to tag up on a fly ball to center. Nationals: C Matt Wieters left after the eighth inning with back spasms but expects to play on Friday. . RHP Jeremy Hellickson (wrist), who has been sidelined since Aug. 16, threw 30 pitches in the bullpen on Wednesday. Hellickson could expand his bullpen session on Saturday if he doesn’t experience discomfort from Wednesday’s session.